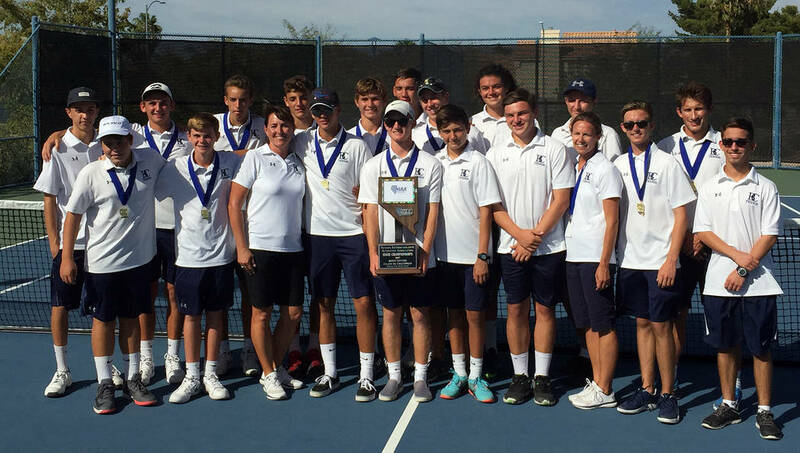 Finishing a season of redemption after last season’s 3A state runner-up finish, the Boulder City High School boys tennis team captured its first 3A state championship since 1977, knocking off defending champions The Meadows 13-5 on Friday at the Darling Tennis Center in Las Vegas. Andrew Huxford Members of the boys tennis team from Boulder City High School celebrate their state championship win on Friday at the Darling Tennis Center in Las Vegas. The Eagles defeated The Meadows after knocking off Northern Nevada challenger Truckee 12-6 in the semifinals and finished the campaign a perfect 20-0. Coming off of strong individual performances during regional play, the Eagles’ three state-bound singles players did their fair share of the heavy lifting against the Mustangs, led by 3-0 efforts from Pappas and sophomore Connor Mikkelson. Sophomore Breton Erlanger finished 2-1 on the day. Sophomores Boen Huxford and Preston Jorgensen finished 3-0, while senior Tanner Montgomery and junior Karson Bailey each finished 2-1. Fulfilling their team goals Friday, several individuals worked toward reaching personal success Saturday during individual play, highlighted by third-place finishes from Mikkelson in singles and Boen Huxford and Jorgensen in doubles. In sort of a passing-the-torch moment, Mikkelson and Pappas battled through a rigorous three-set match, before the sophomore overcame the senior 6-1, 4-6, 6-1. Pappas, the Eagles’ top singles player throughout his tenure, finished fourth, while the team’s new No. 1 moving forward has his sights set higher during his next two campaigns. Top-seeded Boen Huxford and Jorgensen fell short of their championship aspirations but rebounded to beat The Meadows duo of Brian Capp and Ryan Chang 6-3, 6-4 in the third-place doubles match. Boen Huxford and Jorgensen lost 6-0, 5-7, 3-6 to eventual runner-up Justin Finseth and Ben Goodman of The Meadows in the semifinals. Much of the team’s core will return intact, excluding Pappas, Montgomery, doubles player Clayton Pendleton and key singles reserve Sam O’Berto. Mikkelson is optimistic about the Eagles’ chances looking ahead.